With Nookal, users can create and send Letters to Clients or other Contacts such as GPs, specialists, case managers, etc. Use Letter Templates to save precious time when writing these Letters as it is possible to use placeholders which will automatically be replaced by client information. Below explains how to create these templates. For more details on Writing a Letter, click here. 2. Click Letter Templates under Clinical. 4. Add a Title for the Template. The title will be used as the document name when saved to Client Documents. 5. Select a Discipline for the Template. Disciplines will be used to sort Templates so the right one can be found easily when writing letters. 6. Select which Locations the letter should be enabled for. Once in the letter content area, the text toolbar will be displayed to select placeholders. Placeholders can be added by selecting them in the dropdown list of Letter, Client or Case button. They will be added as text in brackets (e.g. [Client.FirstName] which would be replaced by the Client’s First name when the letter is saved). Change character size, colour, emphasis such as bolding, underlining. Split the letter with a horizontal line or create a page break. Letters are generated with the date and a section at the top for the addressee who will be selected at the time of writing the letter. 9. Once done, click Save Changes. The letter will then be in the list of available Letter Templates and ready to be used via the Letter tab in the Clinical Notes section of Clients. 1. In the Letter Templates section, select the Template. 2. Click Edit Template in the right side menu. 2. Click Duplicate Template in the right side menu. A new template with the same name plus (copy) will be added to the list of Templates. 3. Select the (copy) template and click Edit Template. 4. Edit the Template and click Save Changes when done. 2. Click Delete Template in the right side menu. 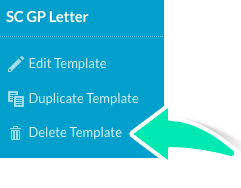 Use this option with care as deleted Letter Templates cannot be recovered.